It all seems quaint now, but violent teenage street gangs were a new phenomenon to 1950s New Yorkers. Among the most notorious of the estimated 150 gangs were the Mau Maus, Bishops, Dragons, and Egyptian Kings. 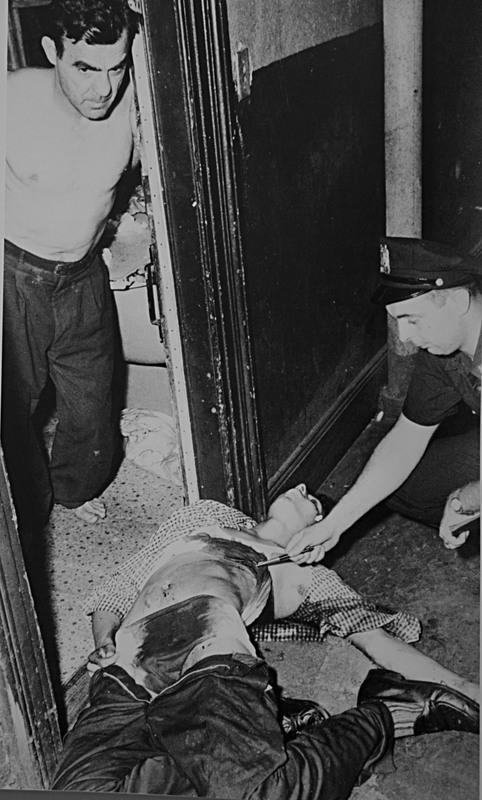 They terrified residents, who felt threatened by the rumbles and sporadic killings that took place in tightly packed postwar neighborhoods. 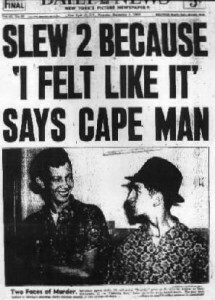 But no gang-related murder got as much newspaper ink as that of the Capeman—aka Salvador Agron, a 16-year-old Puerto Rican kid who had joined an Upper West Side gang called the Vampires. On August 29, 1959, Agron and his crew met at midnight at May Matthews playground on 45th Street off of Ninth Avenue. They were looking to fight members of the Norsemen, a mostly white gang. Instead they came across some local teenagers. Mistaking them for gang members, Agron, dressed in a black satin cape, stabbed two 16-year-olds each in the heart. They staggered to nearby doorways before dying (right). Part of the media uproar had to do with Agron’s dismissive, cocky attitude toward the crime. Anti–Puerto Rican sentiment among city residents didn’t help either. In 1960, he got the electric chair, but then had his sentence commuted in 1962. Released from prison in 1979 (after escaping two years earlier), he became a youth counselor and died in 1986 at age 42 from pneumonia. Paul Simon turned Agron’s life story into a Broadway musical in 1998—but it closed to poor reviews a few months after opening.